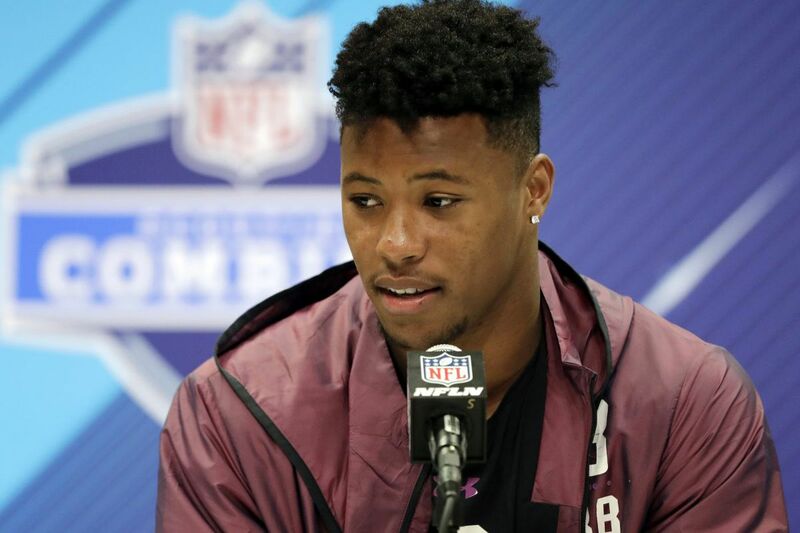 Penn State running back Saquon Barkley speaks during a press conference at the NFL football scouting combine on Thursday. INDIANAPOLIS – For many of the 337 invitees to this year's NFL scouting combine, the four days they spend here will be among the most important of their young lives. How they throw here, how they run here, how they catch here, the poise they show — or don't show — in their 15-minute speed dates with teams could move them up or down – or even off — draft boards and dramatically impact their earning potential for the next three or four years. For Saquon Barkley, however, his stay in Indy is more pleasure cruise than high-pressure business trip. The Penn State running back pretty much is a lock to be a top-five pick in the NFL draft April 26-28, and nothing that happens here is going to change that. If his 16-minute interview Thursday with more than 100 of the nation's reporters is any indication, Barkley is going to knock the NFL's socks off in his interviews. He said all the right things, and had thoughtful, intelligent answers for every question tossed at him. On the possibility of getting drafted by the Cleveland Browns, who have won one game in the last two seasons and have the first and fourth overall selections in the draft, he said, "That would be awesome. Any team that wants to draft me and bless me with the opportunity to play for their franchise is a blessing. Let's get one thing clear right now, Eagles fans. Barkley won't be coming to Philadelphia. I know everybody thinks Howie Roseman can walk on water right now. But this is one magic trick even he can't pull off. Thanks to the success of the Cowboys' Ezekiel Elliott and the Rams' Todd Gurley and the Jaguars' Leonard Fournette and the Panthers' Christian McCaffrey, the value of running backs in the league is on the rise again. Gurley, the 10th overall pick in 2015, was the NFL's offensive player of the year last season, amassing 2,093 yards from scrimmage and 19 touchdowns. Elliott, the fourth pick in 2016, led the league in rushing as a rookie and has averaged 104.6 rushing yards per game his first two years in the league. Fournette, the fourth pick last year, rushed for 1,040 yards and nine touchdowns and helped the Jaguars reach the playoffs for the first time in a decade. McCaffrey, the eighth overall pick last spring, caught 80 passes as a rookie. "The last four top-10 backs – Fournette, McCaffrey, Elliott, and Gurley – all helped their teams become better,'' Mayock said. So would most of the league's personnel people. The 5-11, 230-pound Barkley rushed for 3,843 yards and 43 touchdowns at Penn State. Had another 1,195 yards and eight TDs on 102 receptions. This is not a guy who is going to have to come off the field on third down. "You want to be a complete back,'' Barkley said. "You want to be a guy who's on the field for three downs. That's something I had to do in college. "One of the things I'm proud of is that, from my freshman year to my junior year, I increased my receptions every year. That's a challenge I took on. In the six drafts from 2009 through 2014, just seven running backs were taken in the first round. Only two went in the top 10, only one in the top five. In the last three drafts, five backs have gone in the first round, including four in the top 10 and two in the top five. Snead said that probably has more to do with the quality of the running backs who were taken as opposed to any league-wide change in the importance of the position. "The last few guys, they're just talented human beings,'' he said. "If they had played something else, maybe the value of that position would've gone up.